My dear beloved Biafrans, l want to use this opportunity to thank Chukwu Okike Abiama who has made it possible for us to be among the living in the land of the living. It is not by our power, may his holy name be praised both now and forever Isee Isee Iseee. 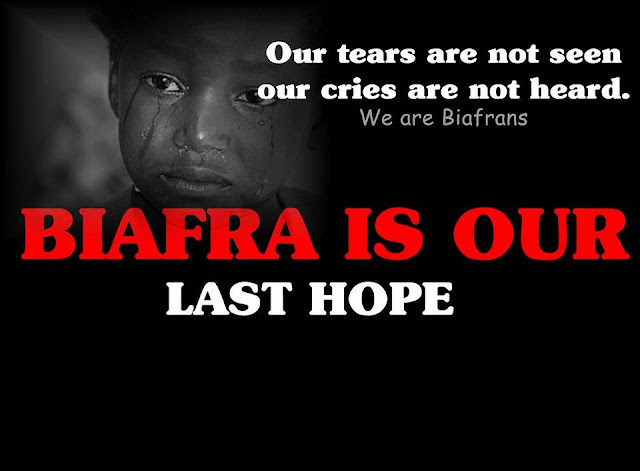 Every 30th of May is a memorable day for Biafrans all over the world. This is because it is a day. Set aside for our great men and women who fought for our freedom to be remembered, more so, in every calendar year we remember our heroes and heroines those that paid the ultimate price with their life, those that died that we may live to talk about Biafra today, we can not forget the 3.5million Biafrans that were killed during the genocidal killings, starting from 6th of July 1967 to 15th of January 1970, apparently, the Nigeria military forces are still killing us, so it is very important that we remember and honor them. Courage, determination and boldness are the huge record we need to keep to mark this year's 30th of May an unforgettable one. We must do better than we did last year, reason... we can't afford to disappoint them, we must work collectively to make sure we achieve greater success than we did last year, it must be a total complete shut down in the whole Biafra land. Furthermore, we must continue to demonstrate to the entire world that we are ready to go home, it does not end in saying it, we have to prove it.